I'm surprised and not also not surprised that there is no review of the Kershaw Groove. Surprised because it is an excellent, unique, incredibly elegant RJ Martin design that is high quality in a variety of uses from everyday carry to personal defense. I'm NOT surprised the knife is not well known as it is already out of production and finding one now is tricky and expensive; however, more serious knife collectors seem to be quickly catching on that this is a knife worth seeking out. "Rainbow" titanium oxide "VIB" coated versions, when they are available, are already selling for $175 plus, nearly three times their original value when introduced. Many knife snobs feel the "grooves" in the blade are functionless and gimmicky. I'm not so sure, as the grooves in the blade, while creating minor challenges in wiping and cleaning the blade, seem to enhance the cutting power of this knife in some scenarios such as apple slicing and box cutting. I carried a Groove last summer (2013) before I knew the knife was going to be discontinued, and I loved every aspect of it. 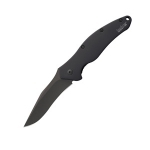 There is no spring, no assist, yet the blade is designed so well, and balanced so well, that it opens very crisply and quickly with a very easy pressure on the flipper tab. I'd call this a "framelock" rather than a liner lock, but technically there are added G10 handle scales which do nicely enhance the grip, so the knife is often listed as a liner lock. I like a slightly larger than average folding knife blade length, and this knife is 3.5" plus (something to be paranoid about in some regions), but nothing I've ever experienced draws attention to the knife when I unfold it for simple cutting tasks. 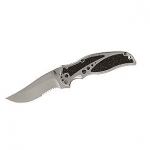 The blade is "Kershaw" sharp from the get-go, and it is extremely durable in terms of edge retention. I suppose one drawback is that the cutting bevel is very narrow, and, because of the grooves, there is little room for sharpening errors which might cause excessive need to re-profile the blade. That's of little concern to me because I now own several of these knives and when one gets dull (and it takes a lot of work to make one of these "dull") I just carry a fresh model and send the "dull" one in to Kershaw to sharpen for me. I'm a capable sharpener, but I also know Kershaw has much better sharpening technology that will allow my Groove to go through many years of resharpening before I ultimately have to retire the knife from blade wear. And, since the knife is discontinued, I want to be able to carry this knife for many years to come. I'm confident I will be able to pass my Groove collection down to my sons when I move on to "the next phase/iteration/what have you." I've owned a lot of knives (talk to my wife for an exact number as it's a sensitive subject at home and she keeps track! ), and the Groove is by far my favorite production folder, not only for its thoughtful fit and extremely efficient and artful design, but because it is (was:() Made in the USA! I'm more than a little disheartened to see that the later model "legacy" knives of the Groove like the Volt and the Scrambler (both designed by RJ Martin) will be manufactured in China...I simply won't play Kershaw's game in selling out America's workforce, so rather than buying the newer sellout models, I'm still searching for after market Groove knives I can purchase to ensure I always have one to use. If you want to understand how beautiful, aesthetic, functional and high quality the Groove is, web search RJ Martin's custom "Havoc folder," which can sell for as high as $1,500, and you'll see the Groove, even at upward of $100 and climbing on Ebay, represents some of RJ Martin's finest work. It is well worth tracking down a couple of these beauties before they become a distant memory of a time when Kershaw was producing its finest blades. Get one while you still can!